Suspended Ceilings Manchester Ltd is committed to Health and Safety achieving ‘zero accidents’ across the business and we take this responsibility very seriously. Our number one priority is to provide and maintain a safe and healthy workplace for our staff, and to ensure we respect the environment in which we operate. 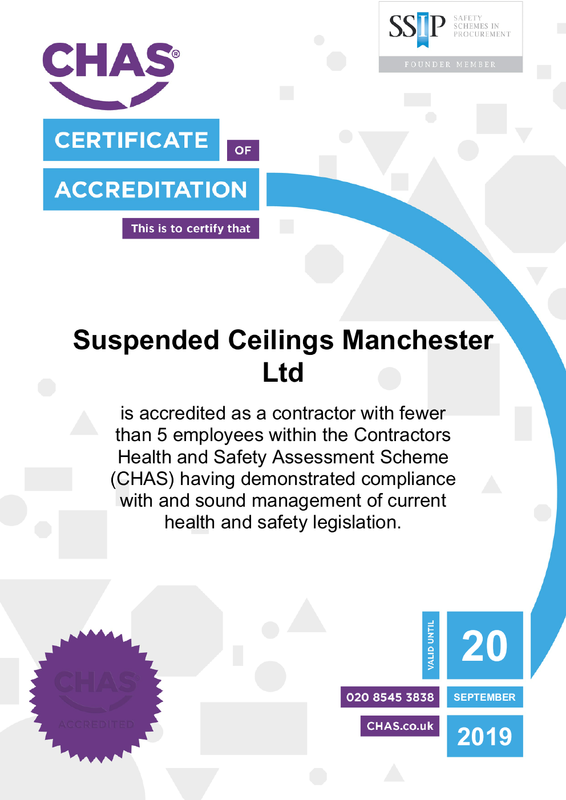 Suspended Ceilings Manchester Ltd are a proud member of CHAS Contractors health and safety scheme, and has been assessed and accredited by showing our compliance to health and safety. Our commitment to health and safety is one of the most crucial factors for us to know that are staff are working safely. Suspended Ceilings Manchester Ltd are a proud member of Constructionline and has been accredited by by showing our commitment in all aspects of sustainability, health and safety and compliance in interior fit out contractors. Suspended Ceilings Manchester Ltd comply with the current Environmental Protection Act, other associated statutory legislation and Approved Codes of Practice (ACOP). This applies to all those who are employed within the company or who are protected by its undertakings. This policy is available to interested parties on request. Suspended Ceilings Manchester Ltd use risk assessments to minimize risks to, employees and your business, as well as complying with the Law. It identifies risks within your company and work operations and the ones with the potential to cause harm. A work Method Statement sometimes called a “Safe System of Work” is a document that details the way a work task or process is to be completed. The Method Statement will outline the hazards involved and detail a step by step guide on how to do the job safely, it will also detail which “control measures” are to be introduced to ensure the safety of everyone who is affected by the task or work process.